In Stellaria media, hair is formed on one side of a stem. 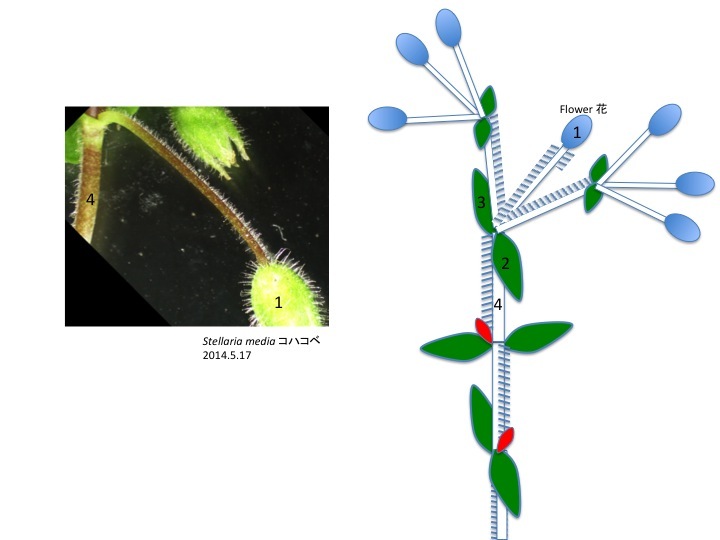 When two shoots are formed from axils of opposite leaves, hair is formed on the adaxial side of each shoot. Linearly aligned hair is formed in one face of a stem in Stellaria media and the direction rotates 90 degree. When we observe the node, an axillary bud is always faces to hair. Shall we remember that hair is formed on the adaxial side of axillary shoots in the cyme, which is shown in the previous page. 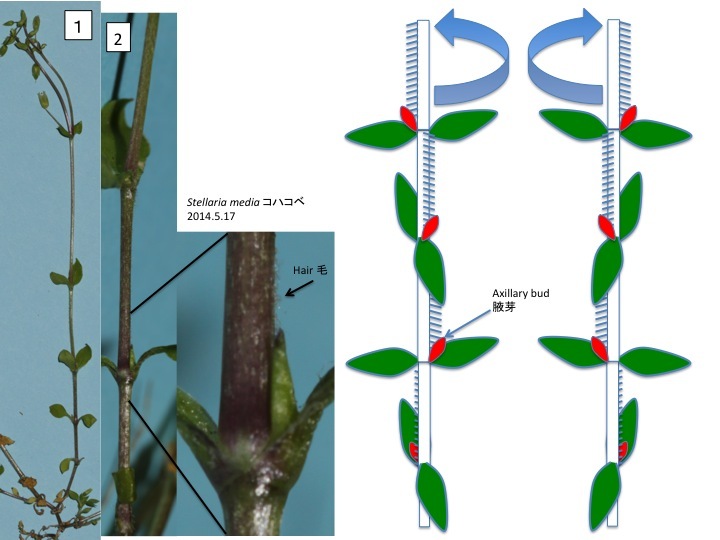 It is possible to interpret that a vegetative shoot of Stellaria media is formed by sympodial branching, although it looks like a monopodial shoot. The rotated direction varies among stems. When two axillary shoots are formed at the node, they have different rotated directions. Phyllotaxis is well explained by the auxin movement (reviewed in Traas 2013). 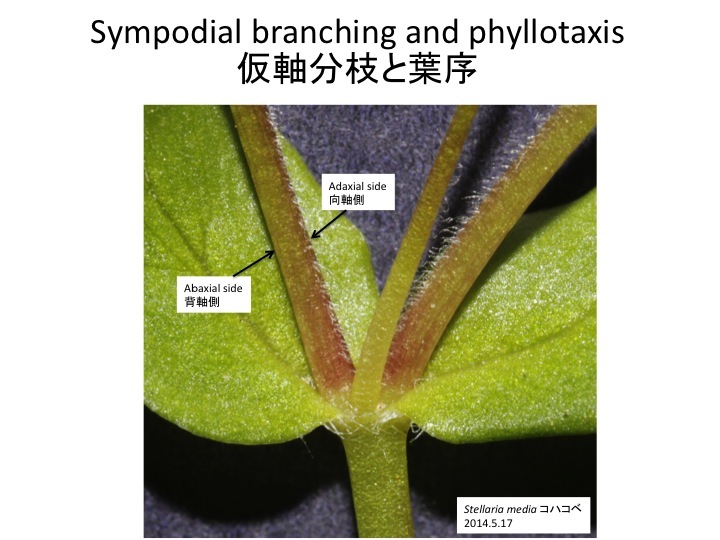 However, it appears that it is still difficult to explain this type of switching..
One of conspicuous innovation of body plans in land plants is the change from dichotomous branching to monopodial branching but the evolution of the development of branching is mostly unknown. Developmental and molecular mechanisms of overtopping appears one of keys to solve the problem and detailed studies of overtopping in sympodial branching may give insight. Traas, J. (2013) Phyllotaxis. Development 140: 249-253. 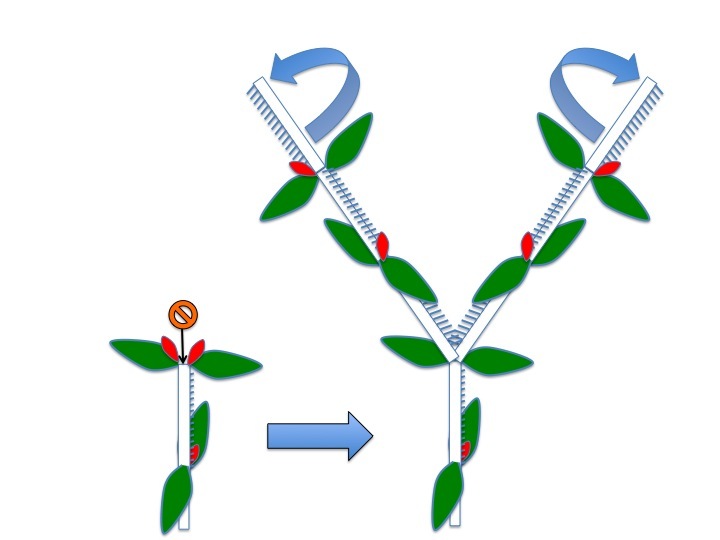 A shoot is terminated with a flower (1 in Figure). The direction of terminal flower pedicel hair is the same as the connected stem (4 in Figure). When new shoots are formed at the axils of two leaves (2 and 3 in Figure), two shoots twist in different directions each other.